I started working on a new scarf design recently and I thought I would report on my progress. I spent a couple of weeks playing with some new design ideas, and nothing much was working for me, until I stumbled on this stitch combination, and I love it. Right to left (since that is the direction in which we knit, we have an eyelet, a left over right crossed cable, a 12-stitch panel in mistake rib, a right over left crossed cable, and another eyelet. 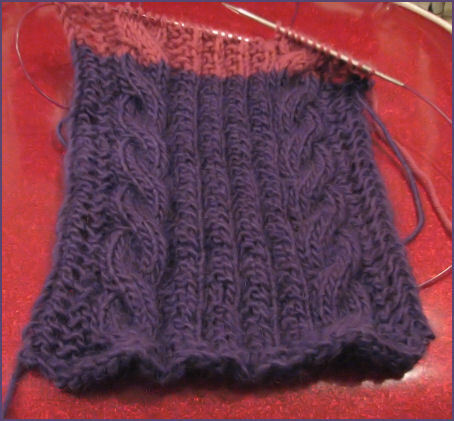 Knit 2 or 4 rows of garter stitch to make a firm edge. Row 1, 3, 7: K2, yo, K2tog; P1, K6, P1; K2P1 (four times); P1, K6, P1; SSK, yo, k2. Row 2, 4, 6, 8: K4; K1, P6, K1; K2P1 (four times); K1, P6, K1; K4. Row 5: K2, yo, K2tog; P1, RC Cable, P1; K2P1 (four times); P1, LC Cable, P1; SSK, yo, k2. Repeat Rows 1-8 until desired length is achieved. Finish with the same number of garter stitch rows that you chose to do in the beginning. BO loosely. RC Cable: Sl 3 stitches to cable needle and hold in back, K next 3 stitches and then K3 from cable needle. LC Cable: Sl 3 stitches to cable needle and hold in front, K next 3 stitches and then K3 from cable needle. Let me know if I can improve on these instructions. Hope you enjoy this pattern! I find it fun because I feel like I’m doing something different every row. I don’t get bored with this one! And for me, that’s a major plus.